Our weekend trip to Siquijor was short but gave us a wonderful introduction to Siquijor’s tourist spots during our Coastal Tour. Unlike most of our trips with friends, our trip to Siquijor was not planned months before. Well, it was mainly because we were mostly based in Cebu and booking in advance was not necessary especially for the buses and boats. You see, Siquijor can be visited via Dumaguete, Cebu or Tagbilaran. There are ferries and slowboats that’ll take you to the island at pre-determined time. We, on the other hand, passed through Dumaguete City to reach Siquijor via Santander in Cebu. Our friend and her companion, for this leg of the trip, was waiting for us there. For those passing by, day trips in Siquijor is possible. You’ll have the option to take either the Coastal Tour or the Mountain Tour. Since we had two (2) days to spare, we opted to do both. A full Siquijor Coastal Tour will cost you around 1,600 Php per head. That is, depending on the number of heads and mode of transportation. You can either contact a local tour operator beforehand or simply get one once you arrive. There are several of local guides waiting for you at the entrance to the port. But if you want less the hassle, reserve ahead of time. Our friend arranged everything for us so it was planned out beforehand. If you can catch the earliest ferry schedule the better. Fastcrafts travel to Siquijor from Dumaguete as early as 7AM. We took the 7:20 AM float to the island. Travel time on board the fast craft is around 40-45 minutes. By 8:30 AM, we were on board the motorcycle and was already starting the tour. It was already around 4-5 PM in the afternoon when we checked in at our hostel. If you are thinking of visiting this beautiful island, here are some of the Siquijor tourist spots you’ll visit when you opt to try the Siquijor Coastal Tour. The first stop to any coastal tour (or any tour for that matter) is the Welcome Siquijor Sign right in front of the St. Francis de Assisi Church. It’s located at the front of the Siquijor Port so its basically the first welcome you’ll receive from the island. Just a few steps from the ‘Welcome Siquijor’ sign is the St. Francis de Asisi Church. The structure serves as a beautiful backdrop of the marker. Take a few minutes to admire the prominent structure that will greet you upon your arrival. The St. Francis de Assisi Church, commonly called as the ‘Siquijor Church’, was founded in the late 1700s and started out as a simple structure built in nipa hut. It was completed in mid 1800s and was made up of coral stones. Nearby is a bell tower that served as a lookout for intruders in the years it was built. When we visited, there was an on-going construction/ maintenance of the bell tower. A few meters from the Siquijor Church is the ‘I Love Siquijor’ signage. Tourists are taken here for a semi-mandatory photo with the signage. There is nothing much to see here, TBH. But if you pause for a while, you’ll notice how clean and inviting the port of Siquijor is and the island as a whole. The port is situated directly in front of the signage so it’s easily one of the things that you’ll notice here. I love the mangrove trees growing nearby and the clean beach surrounding the area. The next stop during a Siquijor Coastal Tour is the Capilay’s Spring Park right at the centre of San Juan. The natural spring has been transformed into a big swimming pool. It is further enhanced by an open landscape with concrete chairs and shady trees. Here you’ll see locals and tourists alike enjoying the cool waters. The kids playing there were happily swimming and diving. What is unique about it is that it sits right at the centre of town where everyone, passing through, can take a refreshing dip. 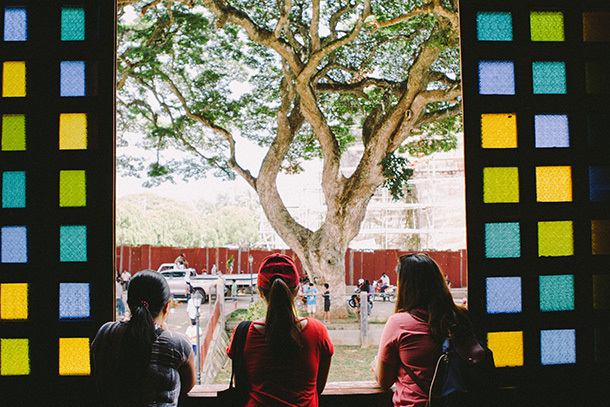 Right after the Spring Park, the next Siquijor Tourist Spot you’ll be visiting is the Century Old Balete Tree. Now, you might be wondering what is special about this. Well, aside from the balete tree (which is mystical in its own right as it is commonly associated with the supernatural), you can dip your feet at the natural pool of water at its base for some fish spa. There are small fishes as well as some big ones ready to tickle and give your feet some loving! You might also want to grab some food and drinks at the Baletebistro right at the entrance. Or perhaps buy some shirts, souvenirs and love potions to bring home. I personally think this is the perfect place to grab some cute Siquijor souvenir for yourself. They have a great assortment to choose from. Besides, we weren’t able to see other tourist spots in Siquijor that sell such a wide variety of goodies. You’ve never been to Siquijor if you haven’t tried the Broomstick Challenge at the Hapitanan Broomstick Challenge. Basically, you need to have a jump shot photo…. ON A BROOMSTICK! Don’t worry, you won’t need to perform a complicated move to get that perfect shot. There’s an elevated platform where you can take your jump. The photographer (professional or not) has a ‘viewing or picture-taking’ area where he/ she can take your photo. The broomstick challenge is at a store. 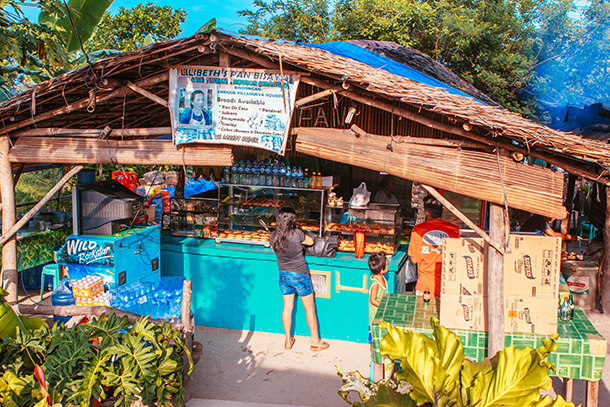 They also sell fresh buko juice as well as Siquijor souvenirs. They are located overlooking the ocean so you’ll get to enjoy the views afterwards. Entrance Fee: None. But you can give a donation. Simply put it inside the donation box placed near the platform for the photo. 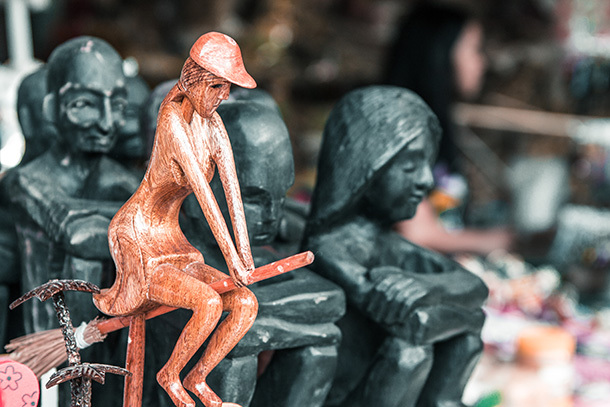 After the broomstick challenge, it’s time to get serious by visiting the St. Isidro Labrador Church and Convent, otherwise called the Lazi Church. The Lazi Church, with its huge convent was declared as a National Cultural Treasure and is built of sea stones and wood. Unfortunately, the Lazi Church was under renovation when we visited and people were not allowed inside. We managed to visit the museum/ convent (which was being renovated too) right across it. There was not much to see here as there were workers inside. There are displays that can interest history-buffs though. Otherwise, you can enjoy taking photos of yourself on the museum’s wide open windows. Pretty dramatic effect, don’t you think? 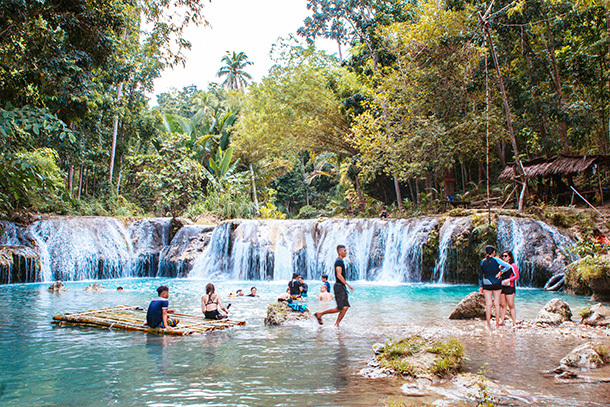 Have you seen that photo of a beautiful falls in Siquijor? If yes, then you probably seen and heard of the Cambugahay Falls! It’s a three-level waterfall that will charm you to take a refreshing dip in its blue waters. If you are into jumping over falls, then this is the perfect place for you too. Families, couples, friends and even individuals are seen enjoying a day here. We saw different groups of people mingling with each other and encouraging each to take the plunge at the top of the falls. There’s a Tarzan Swing for anyone willing to get some adrenaline rush too! After the Cambugahay Falls, you’ll pass by the Man-Made Molave Forest. 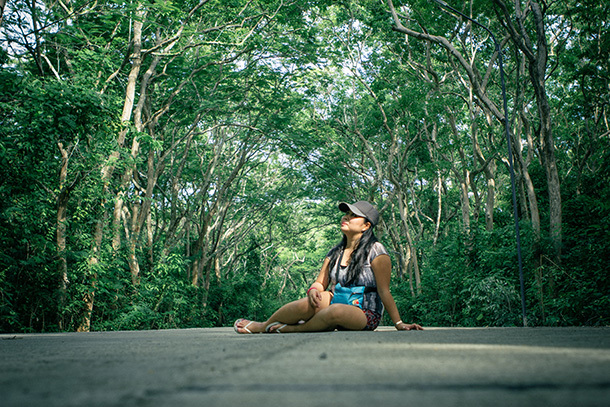 If you’ve ever been to Bohol and tried the Bohol Countryside Tour, you’ll find this next Siquijor tourist spot reminiscent of its very own Man-Made Forest. But instead of the mahogany trees, it’s a long stretch of molave trees planted along the road creating a dramatic effect. The guide will stop here for the mandatory picture with the trees and the scenery. 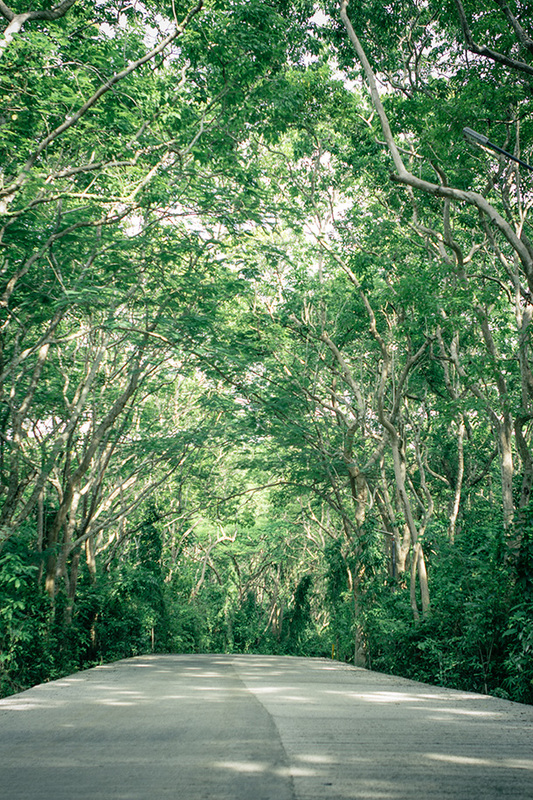 Unlike Bohol’s man-made forest, Siquijor’s man-made forest is brighter and less eerie. Maybe because the trees in Bohol are more denser thus covering most of the sunlight when you are passing through. Nevertheless, the Molave Man-Made forest is very welcoming. Ask your guide the perfect position to take a gorgeous shot with the trees on the background. You won’t be disappointed! 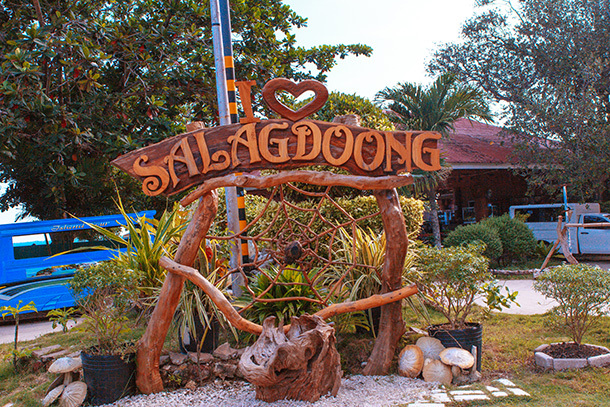 After the long stretch of Molave Trees, the next stop to a Coastal Tour is the Salagdoong Beach Resort. 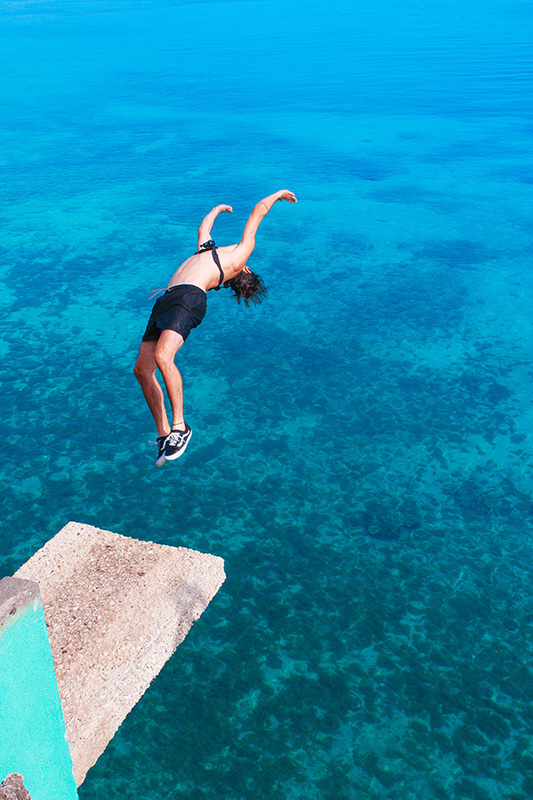 You might be wondering why take you to a resort… Well, for some cliff diving of course! And to enjoy one of the clearest beaches I’ve seen. The resort is developed with cottages, water sports, accommodations, a restaurant and other resort facilities. If you love cliff diving, you’ll surely enjoy taking turns at the resort’s jumping spot. This reminded me of the cliff diving spot at the Fantastic Island in Medellin, Cebu too. Though I’m not sure if it’s the same height. Nevertheless, there were a few daredevils who enjoyed it and kept coming back for more. It was fun watching them take turns. 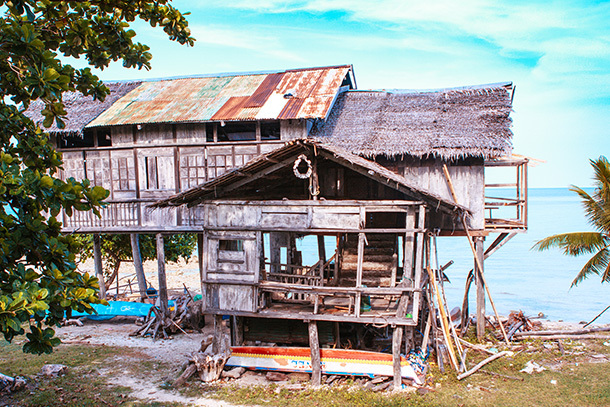 The Cang Isok Old House in Siqujior is considered to be the oldest and still standing house in the island. There’s not much details provided by the locals when you visit. But you got to admire the resilience of the house after all these years. It is believed to have been built a hundred years ago. Imagine that! It would’ve add more charm, I guess, if it was maintained more. After all, who wouldn’t want to admire such a good piece of history! Up for some snacks? 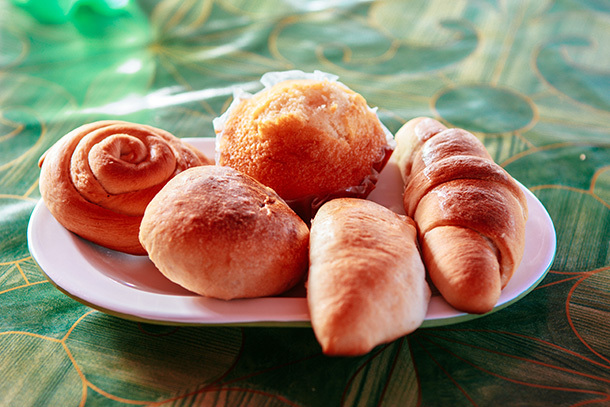 You’ll surely love the freshly baked bread from ‘Pan Bisaya’, a local bakeshop in the island. Their bread is not only unique because of its taste but of how it is baked. They use the old type of stone oven that you can see at the side of the store. 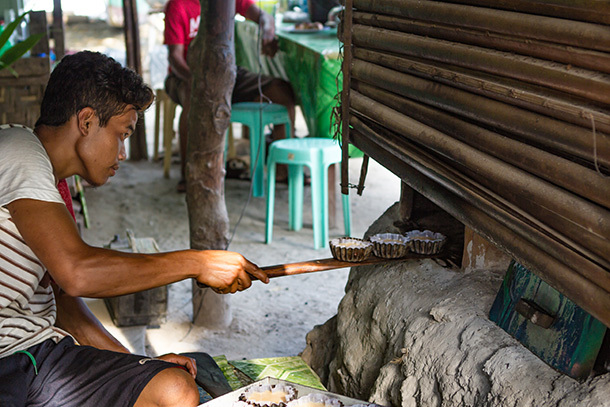 Workers can also be seen at the back preparing the dough to be baked. The bread are delicious and you might want to try it all. It has a pleasant smoky taste to it that we liked. After grabbing some tasty snacks from the Pan Bisaya, the next stop is the Camogao Mangrove Tree. 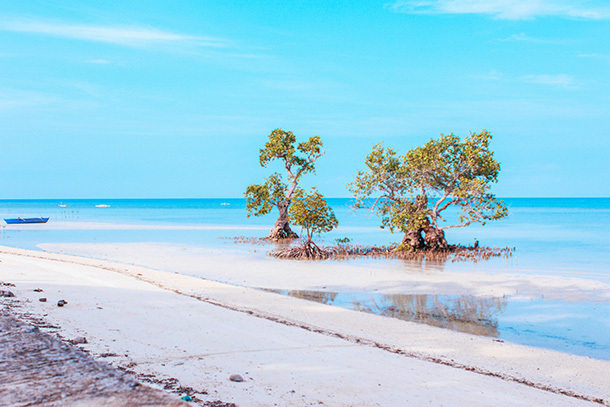 It is considered to be the oldest mangrove tree in Siquijor. Like the Cang Isok Old House, there’s not much details here but you cannot help but be amazed at the unique feature of the mangrove as well as the view from where the Camogao Mangrove tree is. 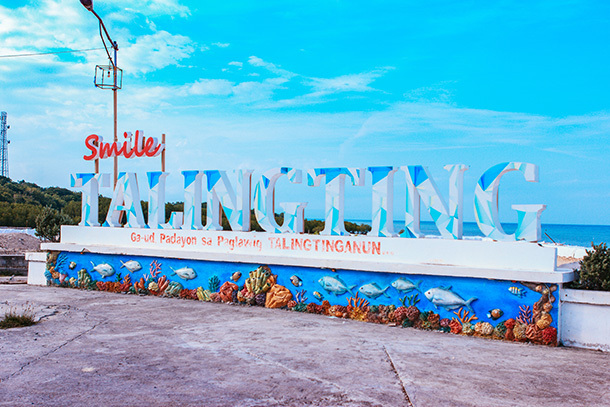 A few meters from the Mangrove is another marker in the island: the ‘Smile Talingting’. According to our guide it was built by a local politician. What’s distinct about this marker is the colourful and tropical vibe of the signage. Spend a few minutes taking your photos here and admire the ocean from behind the signage. The Guiwanon Spring Park is the next tourist spot that is included in the Siquijor Coastal Tour. 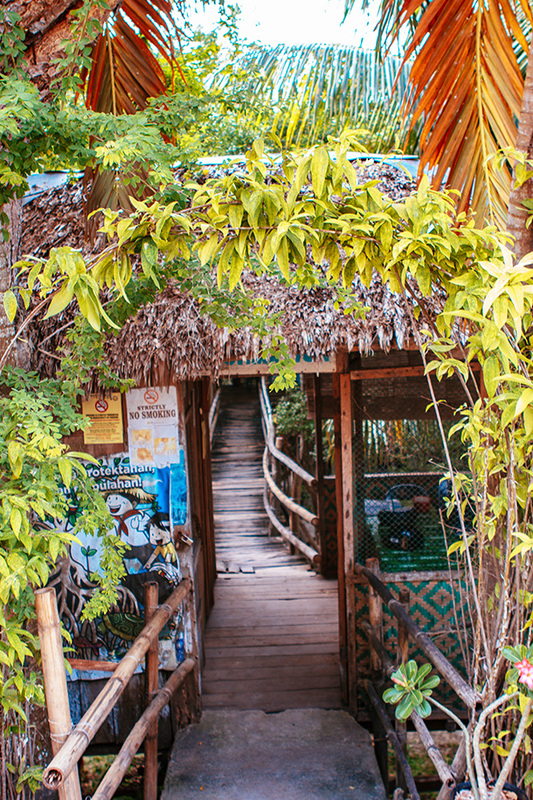 It’s not only a Siquijor tourist spot but an interesting place to stay for a night or two and study Mangroves. My sister previously visited here during their college field trip. And much like her Twin Lakes experience in Dumaguete, her stories about their stay here piqued my interest. The park is built around mangrove trees. It’s connected with a hanging bridge made of bamboo that serves as the pathway. There are tree houses/ accommodations that you can book for a night as well as spacious huts for lectures and events. The last stop on the tour is catching the sunset at the Paliton Beach. Though of course, you can always negotiate with your guide if you want to do this at the beginning of the tour. If you love swimming and basking in the sun, Paliton Beach is perfect for you. The beach is actually photogenic. 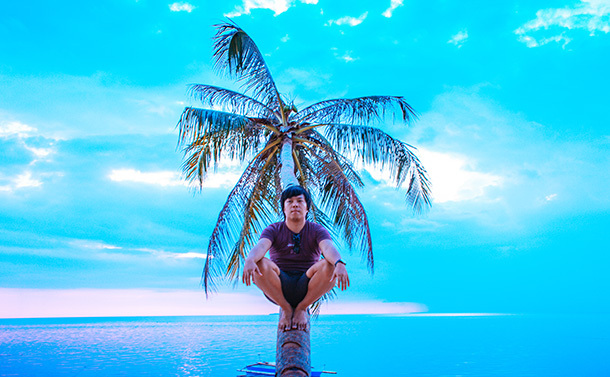 There’s a particular coconut tree that tourists are encouraged and assisted by the locals to take photos on. But I really wouldn’t recommend it for safety reasons. The tree was inclined a certain way that allows people to climb on it and pose for a photo. My husband climbed up a bit and posed for us. He was not that far up so I suppose it was alright. Be careful of falling coconut fruits too. Our guide got hit by a falling fruit while taking a photo of us beside the coconut tree. Fortunately it was his back and not his head. 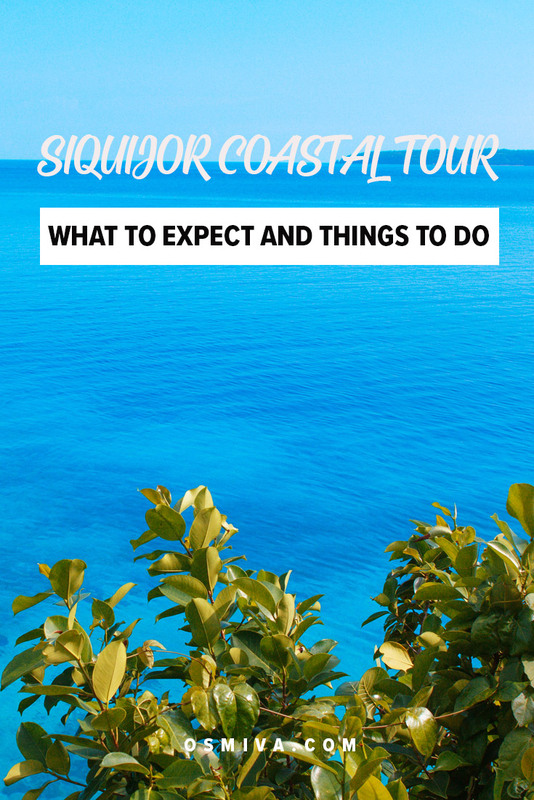 The Siquijor Coastal Tour is basically a tour of the entire island’s coast. You’ll be taken around it so expect constant views of the ocean while doing the tour. 1. Don’t forget to wear something comfortable as you will be hopping on and off your vehicle the entire day. 2. 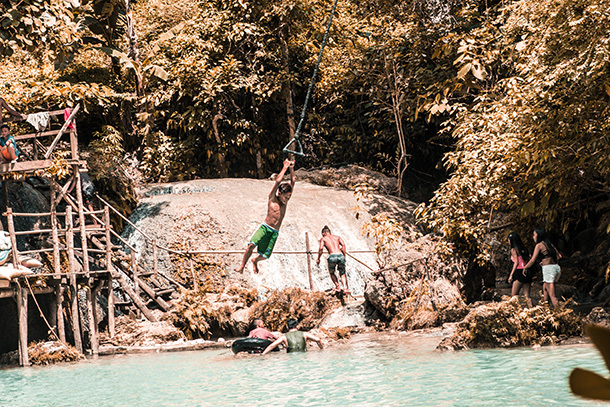 As you probably may have noticed on the listed Siquijor tourist spots, most – if not all – activities involve you getting wet. So wear something comfortable and those that dry easily. 3. Wear slippers or something comfortable that you won’t mind getting wet and dirty. Your feet won’t thank you when you try the 136 steps down to the Cambugahay Falls and going up too! 4. Remember to bring your trash with you wherever you go and don’t litter. Look for designated trash cans. Otherwise bring it with you the entire trip until you get back to your accommodation or once you are back at the port. Look for trash bins there. Let us contribute to keep our islands and the places we visit clean! 5. Don’t forget to bring drinking water with you and keep hydrated the entire trip! 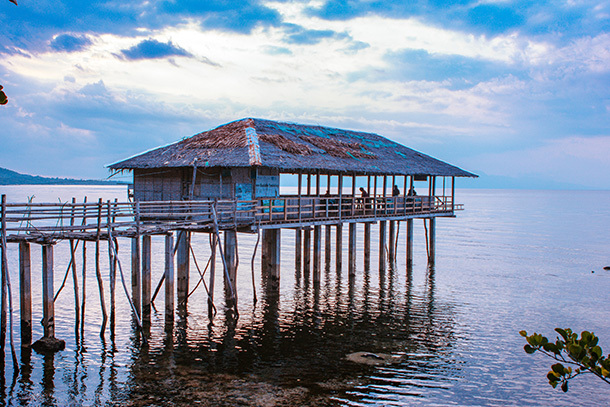 The tour around this Siquijor’s tourist spots can usually be completed within a day. You can easily book your boat ticket after if you are only staying for the day. If not, stay the night and try the mountain tour the next day! If you have plenty of time and would rather save a few cash (especially if you are alone), then do the Coastal Tour by yourself! Rent a scooter/ motorcycle for the day and freely explore the island. As per writing, scooter rental is at 350 Php (whole day). You’ll need your driver’s license and proper safety gear to rent one. Check out the scooter rental near the Siquijor Port. 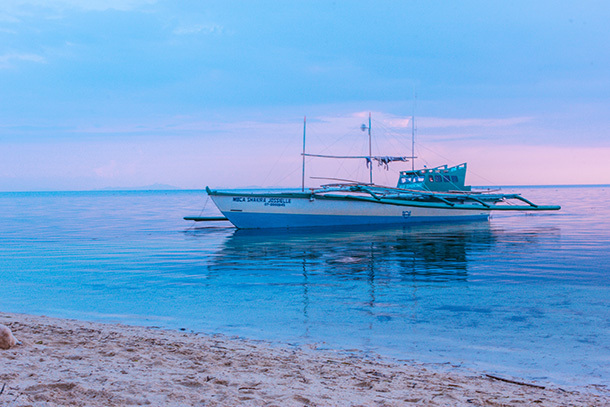 So… Are you up for some island magic in Siquijor? My! I would love to experience dipping my feet in the water at the century old Balete Tree and experiencing the nibbles of the fish – how fun (and ticklish!) And the flying broomstick photo shoot? I wonder how many people get injured with their landings?! What a fun place to visit! The landing is not that high.. Hopefully none got carried away with their jumpshot, though.. Thanks for dropping by Tami!